Richard Pilatzke lives in Littleton, Colorado with his wife Cheryl and lab mix dog Bella . He was born in Montreal, Canada and grew up in upstate New York. Richard has lived in Colorado for over 28 years. He has been fly tying and fly fishing for over 30 years. 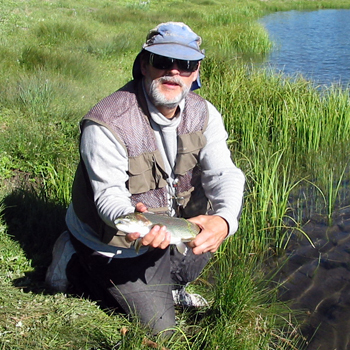 For the last fifteen years, he has specialized in tying flies for and fishing high mountain lakes in Colorado. Richard Pilatzke loves bugs especailly those that drop out of sky, trees or weeds. Listen in and learn the best way to fish terrestrials in the Rocky Mountain region. Richard Pilatze's expertise is high mountain stillwater fly fishing. He'll be talking with us about the stillwater fishing seasons in the Rocky Mountain region, detailing what the fishing conditions will be, what hatches occur and best methods to fish at that time of year. Join us a get dialed into high mountain stillwater fly fishing. He does many fly tying demonstrations at events like The Flyfishing Show, The International Sportsman’s Expo, the Black Canyon Fly Fishing Show, the Western Colorado Fly Fishing Expo, The New Mexico Trout Symposium, the Federation of Fly Fishers National Conclave and at fly tying clinics at many Denver area fly shops and TU and FFF chapters. In addition, Richard is a life member of both Trout Unlimited and the Federation of Fly Fishers. He is a member of Cutthroat Chapter, Trout Unlimited and a past member of the Board of Directors of Colorado Trout Unlimited. Richard’s flies have been exhibited at the Boulder Art Museum and the Prichard Art Museum in Idaho Falls. He is currently a member of the Regal Engineering and Wasatch Angling Pro Staffs. Richard and his fly patterns have been featured in books by Gary LaFontaine, Pat Dorsey, Marty Bartholomew, and Jim Schollmeyer and also in Southwest Fly Fishing. His fly patterns are displayed on the internet in both pictures and video. His biggest influences in fly tying have been Gary LaFontaine, Jack Dennis, John Betts, Craig Matthews, and Al Makkai. What Richard likes best about fly tying is the creative aspect, especially searching out little-known materials to create new patterns.